There is a film festival, nestled in the mountains of Switzerland on the corner of Lake Maggiore near the Italian border, that boasts one of the best venues to watch films in the entire world. It's called the Locarno Film Festival, or Festival del film Locarno, now in its 67th year (only Venice, Cannes, Moscow have been around longer). The Piazza Grande is its famous venue, a plaza in the middle of town that is converted into a 8,000 seat open-air cinema every night, showing old and new films every evening during the week and a half the festival takes place in August. Having attended festivals like Cannes, Telluride and Sundance for years, I decided to make my first trip to Locarno this year, and it's truly as unforgettable as described. I've written many times about how much I love film festivals, returning to Sundance, Cannes, Telluride (and others) annually. I had heard great things about Locarno, especially the Piazza Grande, and finally had the opportunity to make the trip over – not for the entire fest, but for a few days to stop by and check it out, catch some films, and explore Switzerland (it was also my first time in that country). 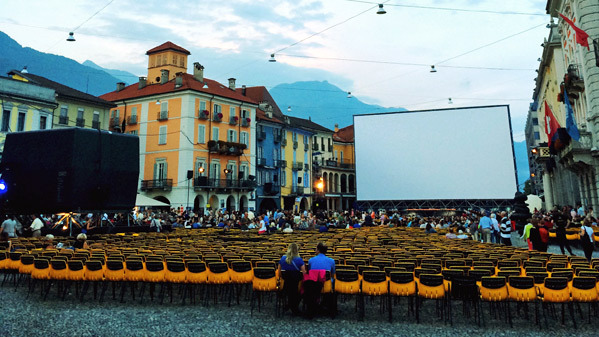 Locarno is a beautiful little town only a few hours from Milan, Italy (where most attendees fly in/out of) and is yet another place that exudes a love for cinema. I was lucky enough to make my way into Locarno on Saturday afternoon, staying through Tuesday, but only had the time to catch 5 films in total. Nothing compared to the 30+ I see at Sundance, but still an unforgettable first journey to a place many cinephiles have only dreamt of visiting. While I adore the town, and venues, the festival didn't have the greatest selection of films. I wish I could've stayed longer and seen more, however their biggest titles were either holdovers from other fests or smaller foreign films that may not appeal to audiences outside of Europe. Their highlights were Luc Besson's Lucy which I'd already seen for its US opening, Joel Potrykus's Buzzard which I saw at New Directors/New Films earlier in the year, Aaron Katz & Martha Stephens' Land Ho! which I saw at Sundance, and Olivier Assayas' [Clouds of] Sils Maria which I'd already seen at its Cannes premiere. There were other world premieres and art house flicks worth looking into, but I was disappointed by the line-up for the most part. It is primarily another small town fest mostly for Europeans, even though it has global appeal in its history and location. Men Who Save the World aka Lelaki Harapan Dunia (dir. 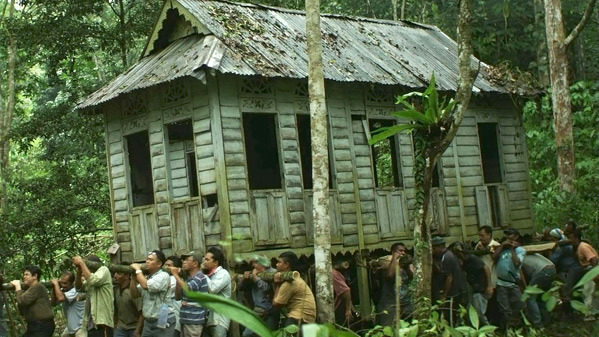 Liew Seng Tat) – A very interesting little Malaysian film about a group of locals who must move a decrepit, old house from one spot in the jungle to another – by carrying it themselves. When an African refugee finds the abandoned building and makes it his shelter, they end up thinking it's haunted by a ghost, and hilarity ensues. It was funnier than I expected, amusing to watch, but didn't have much that drew me in aside from some sleek cinematography. The ending is also a let down, but there are still some aspects to appreciate in the eclectic mix of characters featured. À la vie aka To Life (dir. Jean-Jacques Zilbermann) – Ugh. Made-for-TV junk, despite featuring a great cast: Julie Depardieu, Suzanne Clément & Johanna Ter Steege. Glossy, showy, goofy, and odd. The (based-on-real-life) story is about three women who make it out of a German concentration camp alive at the end of WWII, who then meet up years later at a beach town in France, reminiscing about their lives. There are so many lines where they joke about Auschwitz, or say something that seems terrible about that time yet laugh it off like it was playful. Not to mention it's just dull, bland and boring and should be avoided at all costs. Christmas, Again (dir. Charles Poekel) – This film feels like it belongs in another era, made to fit in the 60s or 70s despite being a contemporary story about how depressing Christmas time is. The music choices, story beats, and cinematography have an old school vibe, but there was something very compelling about it. We follow actor/fellow filmmaker Kentucker Audley (whom I want to see more of now) as Noel, a depressed Christmas tree salesman in Brooklyn dealing with being lonely. It's short, but sweet, and I hope it gets some attention across the Atlantic as well, because it deserves appreciation from North American audiences, too. The Tribe aka Plemya (dir. Myroslav Slaboshpytskiy) – Whoa! I already wrote a glowing review of this film, but it's incredible. The Tribe is presented entirely in sign language, without subtitles or translation or dialogue. Set in Ukraine, it follows deaf students involved in illicit activity – running a prostitution ring, assault, robbery, and everything in-between. The film is brilliant in its concept and the way it challenges audiences to look past dialogue and attempt to understand what's going on through the way people interact, but it's a bit too long and excessively brutal. There were a large number of walk outs throughout, and even though I sat through it and admired its boldness, I'm not sure I can recommend it to too many people. The Hundred-Foot Journey (dir. Lasse Hallström) – Aw, what a charming foodie film! Yea it's a bit schmaltzy, yea it's a great double feature with Jon Favreau's Chef, but it's also heartwarming and inspiring. An Indian family moves to France and opens a restaurant across the street from a Michelin star restaurant run by a stern French woman (played by Helen Mirren), and we watch as the two feud at first before eventually learning to embrace the uniqueness each culture has to offer. The lead Indian boy, actor Manish Dayal, is a delight (his whole family is!) and of course he falls for the prettiest French girl around, but it's entertaining and made me smile. It's exactly the kind of cinematic meal I was looking forward to enjoying. My final film of the festival was The Hundred-Foot Journey, and it happened to be the only one I was able to see in the Piazza Grande. While the weather in Locarno this time of year is fairly warm, it's also the rainy season, and that presents a dilemma when their flagship "theater" is outdoors, without any roof to protect the audience from precipitation. I was hoping to catch the classic 1963 film The Leopard (or Il Gattopardo as it was called there) on my first night in town, but I was still catching up on jet lag and the rain that began to fall just as it was starting didn't help either, so I skipped that one (unfortunately, as I really wanted to see it in this kind of place with this audience). But watching The Hundred-Foot Journey in the Piazza Grande was unforgettable. Ya maybe it's a feel-good Hollywood flick, but it was just what I needed to end my visit. During the day the piazza is open to the public, with half of their signature yellow chairs laid out in front of the giant white screen (the other half stacked nearby waiting to be placed later). At night they shut down the entire area, blocking off every entrance and cobblestone street that leads into the piazza. Attendees must have a ticket, but don't worry – there isn't a bad seat in the house, or maybe, out of the house. The screen is huge, constructed in the street between two buildings, and the projection booth is state-of-the-art with a design that resembles a spaceship. The sound is loud and clear, and the experience is second-to-none. By the end of the film, I had that feeling that I wish I could watch any and everything here. Imagine seeing a Terrence Malick movie in the Piazza Grande! Or The Matrix, or Lord of the Rings, or Boyhood, or The Raid. This is what makes Locarno the wonderful festival that it is – they care about the cinematic experience as much as the films itself (perhaps even more than the films). During one of my screenings I watched a viewer take a photograph of the screen during the middle of the movie, and I motioned to the usher sitting nearby, who promptly called the theater manager and the offender was removed from the screening. That's how it's done. While I wish I would've had even more time to watch films at the festival, if I get the chance to return in the future and the line-up has a better selection of films worth flying over to see, I will certainly make the trip back. It's worth it just to sit in the Piazza Grande every night and watch whatever they decide to show – it doesn't matter if it's a classic film or some foreign feature or inspirational Hollywood movie, I'll be happy. I will always express my love for festivals because they show that there is still a passion for cinema and films from all over the world, even the ones that are hard to convince anyone to see. I won't ever forget my first experience at Locarno, and I'm sure that is the same for any & all cinephiles who sit down in the Piazza Grande for the first time and realize here they are, in the middle of the mountains of Switzerland, watching movies under the stars. I am very lucky that this is my job, that loving movies is something I can call my profession. This festival was yet another distinct reminder of how much joy and satisfaction and energy I get out of these experiences, the entire world of cinema, the art of storytelling. I wouldn't trade it for anything. Wow! Sounds lovely. Swizterland is a magical place. Thanks for sharing your experience AB! How about that proposed contest? I did some coverage for this festival last year and was very disappointed. Let's just say it the film selection is terrible. Ever since they changed the artistic director they've been screening depressing, unilateral, wannabe artsy films that nobody cares about. They managed to invite some cool guests though I'll give them that. Otherwise I'd recommend people to get a daily pass see a couple films and you'll pretty much get a taste of the festival no need to stay longer than that..